Published Dec 1, 2014 by Addison-Wesley Professional. Part of the LiveLessons series. 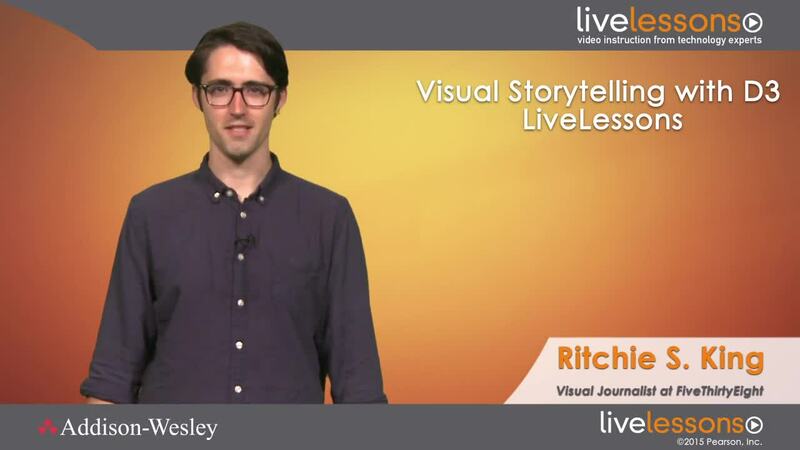 In this video training, Ritchie starts by introducing D3: the beautiful interactive data visualizations it’s capable of creating, the reasons why it’s such a powerful library, and how to start using it. He then takes a brief, but necessary, detour to introduce Scalable Vector Graphics (SVG)–a standard for rendering graphical elements on the web that D3 works particularly well with. From there, he walks through how to construct an interactive bar chart, rendered in SVG, but built entirely with D3, starting with very basic D3 concepts and adding more and more sophistication, lesson by lesson. Finally, he covers how to strike out on your own. After watching this video, designers and developers will feel comfortable diving right in to D3 and telling elegant visual stories with web graphics. Ritchie S. King is a reporter and visual journalist at FiveThirtyEight.com, focusing on data visualization and interactive features. Prior to that, he occupied a similar role at Quartz (qz.com). In a previous life, he was a chemical engineer at a startup that was trying to turn wood chips and switchgrass into fuel. Though he left the world of engineering to become a journalist, he’s still into math and likes to muck with data. His stories and graphics have appeared in the New York Times, Bloomberg Businessweek, Popular Science, and IEEE Spectrum. Lesson 2, “Scalable Vector Graphics (SVG),” is an introduction to SVG, a standard for rendering crisp, beautiful graphics on the web that D3 works incredibly well with. This lesson covers all of SVG’s fundamentals, from using the SVG markup language to create basic shapes in the browser to making an entire bar chart from scratch. Lesson 3, “Using Selections in D3,” introduces selections in the D3–the library’s way of granting access to elements on a web page so they can be manipulated based on data. This lesson walks through how to create selections and use them to change the contents of a web page. Lesson 4, “Data-Joins, the Heart and Soul of D3,” introduces the programming construct that lies at the very core of D3–the data-join. This lesson shows how, using data-joins, to create elements on a web page from data, including how to make an SVG bar chart the D3 way. Lesson 5, “Scales and Axes,” is an introduction to making chart axes the easy way in D3. This lesson covers how to use D3’s scales to map data to pixels and how to use D3’s axis generators to automatically create axes for data visualizations. Lesson 6, “Loading and Manipulating External Data,” introduces D3’s way of bringing in external data files, such as CSV files. This lesson covers how to load external files, filter the data those files contain, and deal with asynchronous requests. Lesson 7, “Making Charts Interactive and Animated,” introduces D3’s techniques for making interactive and animated data visualizations. This lesson covers how to add animated transitions to a bar chart and create clickable buttons that let the user control the data that is being displayed, including a play button. Lesson 8, “Making a Small Multiple Line Chart,” covers how to build an especially elegant form of data visualization–a small multiple chart. This lesson covers how to easily create multiple line charts on a web page and presents some rules of thumb to follow for using D3 effectively. Lessons 9, “Where to Go from Here,” discusses how to strike out on your own with D3 after watching these LiveLessons. This lesson introduces some of D3’s more advanced features as well as helpful tools and resources.